Elizabeth Feodorovna was born in 1864, a German Hessian princess. Her maternal grandmother was Queen Victoria. At age 20, Elizabeth married Grand Duke Sergei Alexandrovich, brother of Czar Alexander III. She at once began to study the Russian language in order to become familiar with the culture and religion of her adopted homeland. She and her husband lived on a country estate in Ilinskoe, near Moscow, and there attended church regularly. It was here that young Elizabeth, shocked by the poverty of the peasants, first began her response to the poor. Aware that many children died soon after birth, Elizabeth convinced her husband to bring a midwife to serve the district. In 1891 Elizabeth announced her decision to become Orthodox, assuring her Lutheran father that she had not been pressured by her husband, but was taking this step of her own free will. Her decision was not a response to the "outer charms" of the Church, she assured her brother, but rather was due to "pure conviction -- feeling [Orthodox Christianity] to be the highest religion." Czar Alexander III appointed her husband governor of Moscow, after which the couple moved to the city. Elizabeth now had many social obligations -- attending balls and concerts, receiving guests -- but also visiting hospitals, old age homes, orphanages and prisons. Each day she was confronted by the enormous contrast between the luxury of court life and the terrible poverty in which large sections of the population lived. Putting her large income to good use, she did all that was in her power to alleviate the suffering of the poor. In 1894 Nicholas, heir to the throne, became engaged to Elizabeth's younger sister, Alice. Elizabeth rejoiced at her coming to Russia and did all she could to help her sister prepare for her role as empress. Unfortunately this could not be done gradually. The same year Czar Alexander III died suddenly. The following day Princess Alice was received into the Orthodox Church and was given the name of Alexandra Feodorovna. Her marriage to Nicolas took place a week later. At the end of the 19th century, many changes were taking place as a consequence of industrialization, the rapid growth of an impoverished urban working class, and the growing influence of Western ideas. Many lived in expectation of social reform when the new czar was crowned. Nicholas, however, though a gentle and compassionate man, held fast to his belief in absolute monarchy. In rapid succession four daughters were born to the imperial couple, and finally, in 1904, a son, a successor to the throne. Unfortunately it was soon apparent that he suffered from hemophilia. During the war with Japan in 1904, Elizabeth organized relief for soldiers. Taking possession of halls in the Kremlin Palace, she set up workshops where thousands of women worked at sewing machines and packing tables, gathering clothes, food, medicines, gifts, icons and prayer books to be sent the front. War enthusiasm quickly turned to war bitterness as reverse followed reverse in the contest with Japan. As casualty lists arrived from the front, social tensions rose sharply. There was increasing poverty and hunger, as well as renewed activity to promote social reform. Protests, strikes and terrorist actions were met with increased police and military repression. There were also plots to murder members of the royal family. On February 4, 1905, with a climate of revolution gripping the city, Grand Duke Sergei was assassinated when a bomb was hurled into his carriage. Elizabeth hastened to the place of the tragedy and knelt by the mutilated body of her husband and embraced it. On the day of the funeral, she arranged that free meals be served to the poor of Moscow. Three days later, Elizabeth secretly visited the imprisoned murderer of her husband. She offered forgiveness on her husband's behalf, begging him to repent of his sin and to seek a pardon. The man, however, regarded his act as a virtuous deed. Elizabeth left a Bible and an icon in his cell. Czar Nicholas rejected her plea for mercy. Eventually the man was hanged. Elizabeth had a large crucifix erected over the place of her husband's death, with the text, "Father forgive them, for they know not what they do." Affliction brought about a profound change in Elizabeth's soul. She withdrew from social life, renounced luxury, and no longer ate meat. Her bedroom in the Nicholas Palace was done over in such austerity that it resembled a nun's cell. She opened a hospital in Ilinskoe where she herself served men who had been injured in the war, then opened another small hospital in Moscow. Two-thirds of her jewelry she gave away; the rest was used to buy a property with five buildings at Ordynka on the far side of the Moscow River where she resolved to found a religious community for women who would serve the poor. She dedicated the community to Saints Martha and Mary in the hope that the sisters would "combine the lofty destiny of Mary -- given to hear words of eternal life -- with Martha's service to Our Lord through the least of His brethren." The community's rule drew inspiration from the words of the Savior: "I was hungry and you fed me . . . sick and you cared for me." Elizabeth moved into a few simply furnished rooms. For several years she was busy furnishing the buildings so they could function as a church, hospital, polyclinic, a home for the nuns, school, orphanage, library, and priest's residence. From the beginning, she made herself available to every person in need. On February 10, 1909, Elizabeth's took off her widow's habit and put on the robes of the Sisters of Love and Mercy. At the same time she was officially appointed Abbess of the community -- only six women at the time. On the occasion she said, "I am leaving the brilliant world where I occupied a high position, and now, together with all of you [my sisters], I am about to ascend into a much greater world, the world of the poor and afflicted." Gradually more sisters joined the community. Their spiritual father was the greatly revered priest, Father Mitrofan Serebrenski, who moved with his wife into the priest's house. The daily schedule resembled that of a monastery: Liturgy, vespers and matins were celebrated daily, and on Saturday, the vigil. An akathist was prayed four times a week. The nuns' tasks were to nurse the sick, visit the poor, and care for children. They also were given an education. While organizing the work, receiving guests, and writing many letters, each day Mother Elizabeth helped attend to the sick, sometimes staying at a bedside until dawn. She lived in strict accordance with the rule and was obedient to her spiritual father. Her life was a sober one and she prayed a great deal, with the Jesus Prayer at its core. Though her life was ascetic, she took pains to reassure relatives that she was in no way harming herself. "Some kindhearted busybodies are afraid I will end by breaking down my health, don't eat enough, don't sleep enough .... That is not true. I sleep eight hours, I eat with pleasure, I feel physically marvelous, well and strong." Since the turbulent years following the uprising of 1905, Russia's circumstances had gradually become calmer. The Czar's power was curtailed with the establishment of a State Duma. A number of civil rights were recognized. After 1910 the economy began to recover. Production increased, foreign companies invested in Russia, farming land was reclaimed in Siberia. Such stars of the Russia opera, theater, and ballet as Chaliapin, Pavlova and Diaghilev were acclaimed at home and abroad. The Convent of Martha and Mary also flourished. The best medical specialists of Moscow worked at the free hospital. There was an orphanage and a soup kitchen. Mother Elizabeth herself went into the poorest neighborhoods, offering care and education in the convent to abandoned children who had been living on the street. Though the economy was improving, poverty was greater than ever. Every year in Moscow, thousands of babies were abandoned. News of the outbreak of the First World War caused her to weep; she saw in it the destruction of Russia. When the casualties began to arrive, Mother Elizabeth and her growing community devoted themselves to the care of the wounded. Russian troops suffered staggering losses. Mother Elizabeth kept in contact with the imperial family by mail. Her relationship with her sister, however, was strained by the Rasputin affair. The Czarina felt personally responsible for her son's incurable hemophilia, an illness that mothers transmit to their male children. In desperation she consulted not only doctors but charlatans. The last was Rasputin, a peasant whom many regarded as a holy man. He alone seemed able to stop the hemorrhages of the Czarevitch. The Czarina saw him as God's answer to her prayers. In time, through the Czarina's influence, Rasputin became influential in state affairs. In this matter Elizabeth again showed great spiritual insight. In vain she implored her sister to free herself of Rasputin, but talks with her sister only resulted in a cooling of their relationship, for the empress credited Rasputin with her son's survival; she saw Rasputin as a "maligned saint." Mother Elizabeth's efforts to speak on this matter with the Czar also failed; he was about to leave for the front and had no time. In these events, Mother Elizabeth foresaw the end of the imperial rule. That same year Rasputin was murdered by members of the nobility, who blamed Russia's defeats on the front on Rasputin's influence in St. Petersburg. The situation in Russia was chaotic. There were millions of dead to lament; the economy was in tatters; there was a shortage of food everywhere. Rebellion, strikes, terrorist actions and repression increased. During the February revolution of 1917, the convent was stormed by an angry mob convinced Mother Elizabeth was a German spy. In response, Father Mitrofan with Elizabeth and her nuns held a moleben in the church. At last the crowd left the convent. Mother Elizabeth was unharmed but her peril was obvious. Several times diplomats offered her a chance to escape, but she refused, determined to share the fate of Russia. In March 1917, Czar Nicholas abdicated, and shortly thereafter, the family was interned in the Summer Palace. When Mother Elizabeth heard that they were arrested, she said, "This will serve for their moral purification and will bring them closer to God." For a few months after the Bolsheviks seized power in October, the Martha and Mary Convent was spared and was even provided with food and medicines, but the sisters no longer went outside. The daily schedule was not changed, although the prayers were longer. During the Liturgy the church was crowded. Each day saw radical changes. Factories and private property were expropriated. In February the "new" (secular) calendar was introduced. In March the Brest-Litovsk peace treaty was signed. For the first time since the rule of Peter the Great, Moscow became the capital. Red flags were raised over cathedrals. The Czar, his wife and children, a doctor and three servants were deported to Ekaterinburg where they were closely guarded and roughly treated. Resignedly, Nicholas and his family accepted all humiliations. In April 1918 Mother Elizabeth was arrested. Attempts by Patriarch Tikhon to obtain her release failed. She was taken away with Sister Barbara, who chose to share her abbess's fate. On the way to prison, she was able to smuggle a letter to the community: "The Lord has found that it is time for us to bear His cross," she said. "Let us try to be worthy of it. . . .Blessed be the name of the Lord for evermore." She spent the last months of her life in prison in Alapayevsk, not far from Ekaterinburg. Other members of the Czar's family and of the imperial household were imprisoned with her. 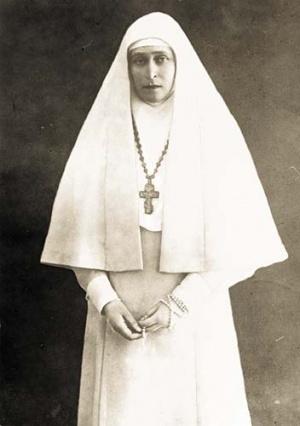 On July 18, 1918, the day after the Czar and his family were murdered, Mother Elizabeth and the other prisoners with her were thrown alive into an old mine shaft. When the executioners hurled her into the 60-meter pit, they heard her say, "Lord, forgive them, they know not what they do." Because of ledges and projecting logs, not all died in the fall. A peasant who witnessed what happened said he could hear voices in the shaft singing the Cherubic Hymn from the Holy Liturgy. The executioners threw in one hand grenade, then another. The following year priests were able to recover the bodies of Elizabeth and Barbara. Two years later, after long wanderings, the coffins were brought to the Russian convent at Gethsemani just outside Jerusalem. In 1991 the martyrs, Grand Duchess Elizabeth and Nun Barbara, were canonized by the Russian Orthodox Church. The feast day of Elizabeth is 5/18 July. The convent survived for another seven years although the Communist authorities prohibited the community continuing its charitable work. The hospital became a state-run institution. Father Mitrofan and his wife were arrested in 1926 and died in the Gulag. After the collapse of Communism, many brotherhoods and sisterhoods based on the example of the community of Martha and Mary, were established which are now devoting themselves to health care, relief of the poor and education. If we look deep into the life of every human, we discover that it is full of miracles. You will say, "Of terror and death, as well." Yes, that also. But we do not clearly see why the blood of these victims must flow. There, in the heavens, they understand everything and, no doubt, have found calm and the Truer Homeland -- a heavenly Homeland. We on this earth must look to that Heavenly Homeland with understanding and say with resignation, "Thy will be done." Completely destroyed now is the "Great Russia without fear or reproach," but "Holy Russia," the Orthodox Church, the Church against which "the gates of hell shall not prevail," exists and exists as never before; and those who believe, who have no doubts, have an "inner sun" that illuminates the darkness of the thundering storm,"
Lily Emilia Clerkx is an iconographer and a member of the Orthodox Peace Fellowship living in Amsterdam. Her essay uses material included in Grand Duchess Elizabeth of Russia by Lubov Millar, published by the Nikodemos Orthodox Publication Society.